Raised by a single mother in the American West, Khosi Saqr never knew his dad -- a charismatic Egyptian-national with a gambling problem and a sprawling Christian-Muslim family. When a crisis in Khosi's life makes him wonder more about his own identity, Khosi decides to travel to Egypt and find his father -- risking a trip that goes against all of his deepest instincts. What he discovers, in Cairo, is much more startling than he'd imagined it could be. Pauls Toutonghi was born in 1976 to an Egyptian father and a Latvian mother. His writing has appeared in Granta, The New York Times, Zoetrope, VQR, The Boston Review, Five Chapters, One Story, Sports Illustrated, Tin House, and numerous other periodicals. He received a Pushcart Prize for his short story, Regeneration, which appeared in The Boston Review in 2000, when Pauls was twenty-three years old. Red Weather, came out from Random House in 2006. It was translated into Latvian and German — and received good reviews in periodicals across the country. His second novel, Evel Knievel Days, came out in 2012, and was a featured book on NPR's All Things Considered. He is the father of twins. good bread baking is indescribable in its evocation of innocence and delight. "Funny and winsome...quirky and heartfelt novel." compulsively readable novel about the unbreakable bonds of family — and baklava. 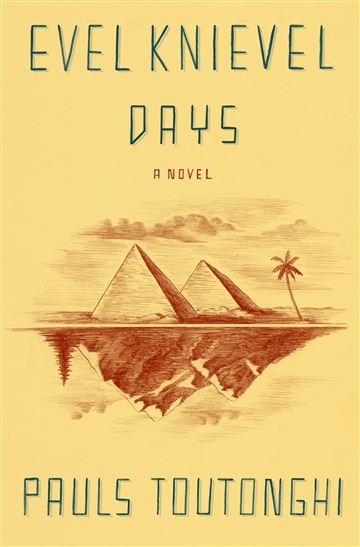 "Beautifully written, Evel Knievel Days takes readers on a wry, irresistible journey.